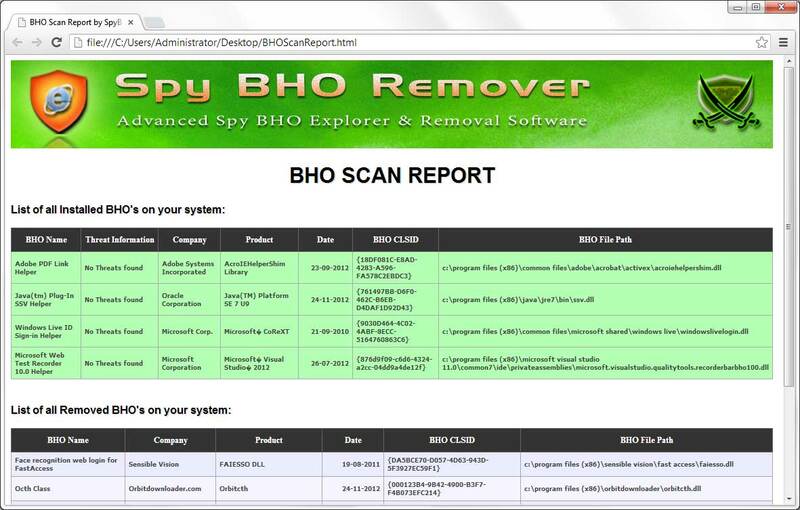 SpyBHORemover (formerly BHORemover) is the advanced tool to explore and remove Malicious BHO's from your system. BHO stands for 'Browser Helper Objects' which are plugins written for 'Internet Explorer' to enhance its capabilities. Often this feature is being misused by many spyware programs to monitor user's browsing habits and to steal the users credentials silently. Also some of the BHO's slow down the system considerably. SpyBHORemover helps in quick identification and removal of such spy BHO's present in the system. It not only performs heuristic based threat analysis but also provides Online Threat Verification mechanism which makes it easy to differentiate between legitimate and malicious BHOs. It also presents 'Backup & Restore' feature which makes it easy to remove and re-install the BHO any number of times. Users no longer have to worry about accidental removal of BHO as all removed BHOs are automatically backed up which can then be restored from 'Removed BHO List'. It also comes with a unique feature to completely enable/disable all installed BHOs at one shot. It works on wide range of platforms starting from Windows XP to latest operating system, Windows 8. Here are the screenshots of SpyBHORemover in action. 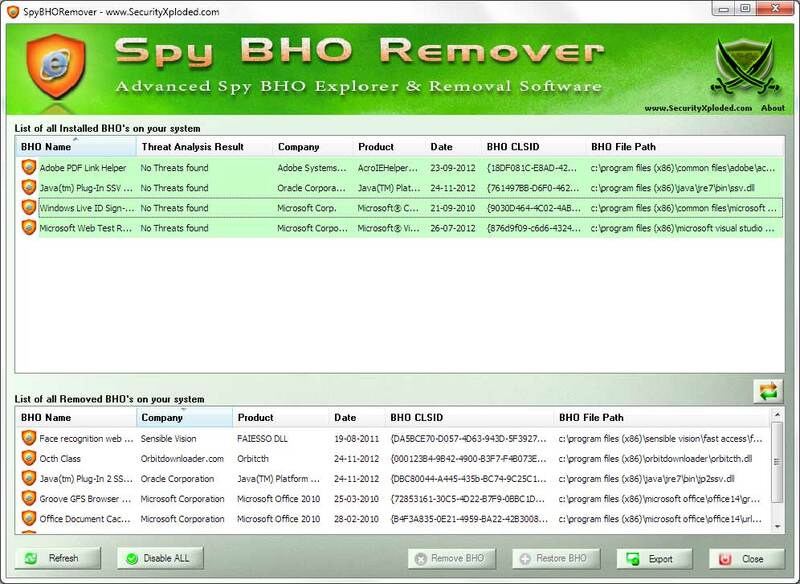 Screenshot 1: SpyBHORemover displaying currently installed as well as removed BHO's from the local system. You can also see the Right Click Popup Menu showing various options for quick execution of desired action.